"Close to public transportation and the train station." "Great location. Close to public transport and the train." Not great access by car, with poorly rated parking. Near to the city centre with good shopping options nearby. Affordable parking. "Fantastic service." Service efficiency and reception are OK, but management are lacking. "Rooms are old, poorly cleaned, and small." Beds are standard, but furnishings and room maintenance are lacking. Mediocre sized, poorly cleaned bathrooms. Shower can be a problem. Rated 65/100 based on reviews from all travelers. "Great location near lots of shopping." Close to public transport and the train. Not great access by car, with poorly rated parking. Affordable parking. "Rooms have problems with size, cleanliness, and maintenance." Mediocre sized, poorly cleaned bathrooms. Old rooms, poor furniture and A/C, and decent beds. Shower can be a problem. Rated 58/100 based on reviews from all travelers. Rated 67/100 based on reviews from all travelers. "Smaller rooms with average beds." Located in Long Island City, Days Inn by Wyndham Long Island City is within a 15-minute drive of United Nations Headquarters and Memorial Sloan-Kettering Cancer Center. This hotel is 2.7 mi (4.3 km) from Roosevelt Island and 3 mi (4.8 km) from Central Park. The preferred airport for Days Inn/Long Island City is New York, NY (LGA-LaGuardia). 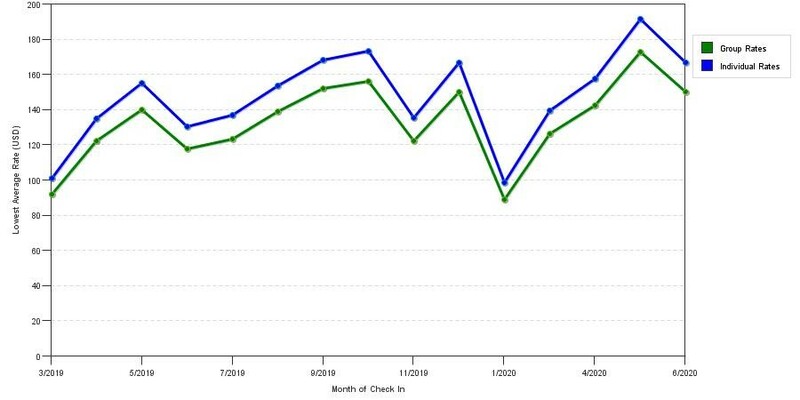 The graph above is trends of room rates for both group/meeting rates and the lowest online individual prices our rate checker could find at the time the group offer was placed. The most competitive group/meeting rate displayed is 9.8% in the month of December 2019 and the highest average individual rate is $187 in the month of October 2019. This chart will show past seasonality and also project future months. If you are flexible with dates, you may want to consider staying at Days Inn by Wyndham Long Island City in a month when rates are lower.